The Alaska Earthquake Information Center located a strong earthquake (magnitude 6.3) that occurred on Tuesday, October 2, 2007 at 10:00 AM local time (18:00 UTC) in the Alaska Peninsula region (red star on the above map). The AEIC located over 300 aftershocks with mangitudes greater than 2 in two weeks after the mainshock (open circles). Eight aftershocks had magnitudes greater than 4 and three had magnitudes greater than 5. The two largest aftershocks of magnitude 5.2 occurred three minutes and three hours after the mainshock. This earthquake is the largest to occur in the region since the M6.2 event on November 20, 2005 (white star on the above map). The mainshock and the largest aftershock were felt in the Alaska Peninsula communities. The October 2, 2007 earthquake occurred on the convergent boundary between the subducting Pacific and the overriding North American crustal plates. This region, where the two plates are being forced directly into one another, is one of the world's most active seismic zones. Over one hundred earthquakes of magnitude seven or larger have occurred along this boundary in the past hundred years. 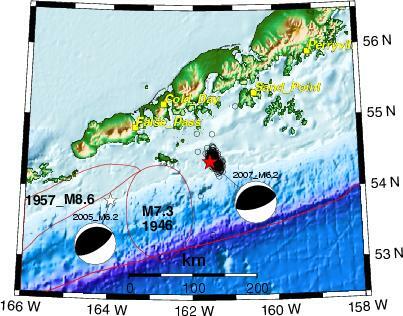 With the exception of the Unalaska and Shumagin seismic gaps, all portions of this plate boundary have ruptured within the past hundred years. The current sequence of earthquakes is located within the so-called Shumagin seismic gap. According to the crust deformation measurements, no significant strain is being accumulated within the gap.